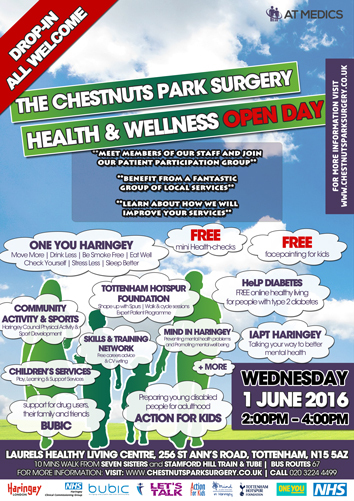 The Chestnuts Park Surgery will be hosting a Health & Wellness Open Day for all members of the public on Wednesday 1st June 2016 between 2.00pm and 4.00pm – all are welcome to attend. See poster below. The event aims to raise awareness about and allow patients to experience a number of local health and social care service providers accessible through the surgery for patients and residents of Haringey. Visitors will also have the opportunity to meet PPG representatives and members of practice staff, particularly newer team members, and will be treated to FREE mini health checks, whilst younger visitors can enjoy FREE face painting. The programme includes Tottenham Hotspurs Foundation who will be promoting their health programmes which include Shape up with Spurs, Expert Patient Programme and walk and cycle sessions. One You Haringey, a free service committed to helping patients make simple changes towards better health and happier lives, as well as Tottenham Active, a programme aimed at increasing the number of people accessing sport and physical activity opportunities in the Tottenham area. Action for Kids will be raising awareness about their work with young people with learning disabilities from the age of 14 to help with their transition to adulthood and to help them prepare for work, and Skills & Training Network, an educational and training charity based in North London will be present to help long-term unemployed or socially disadvantaged young people and adults with free weekly careers advice and CV writing workshops – especially women from Black, Asian, Minority Ethnic and Refugee backgrounds. We will also be joined by Bubic, an award winning community-based organisation that provides support for drug users, ex-drug users, their family and friends, in addition to the Community Dental Service, on hand to deliver Oral Health advice. Let’s Talk IAPT is a free NHS evidence-based talking therapy service for people 16 years old and over, who are worried or have low mood and the will be present in addition to HeLP Diabetes, a new online healthy living programme for people with type 2 diabetes..
Triangle Children, Young People and Community Centre is our local Children’s Centre and brings together a range of services for children under five and their families such as family support, health and education, they will be present in addition to Haringey Play Association who are committed to raising awareness and understanding of the fundamental importance of play in a child’s life. Mind in Haringey work to prevent mental health problems, promote mental well being and ensure those with mental health problems are respected and included in our local community, and they will be present on the day to engage with patients. The Bridge Renewal Trust will be promoting the range of therapies on offer at the Bridge Complementary Health Centre, based within The Laurels Healthy Living Centre. There will also be the opportunity to find out more about the Home from Hospital service, which provides practical and emotional support to patients aged over 50 years old to return home safely from hospital on discharge; in addition to the Outreach and Befriending services for the elderly. Visitors will also get the chance to learn more about gardening, cooking and food safety, as well as information on how to enjoy the food they have grown. A number of other services will be present for the whole family to benefit from. AT Medics practices schedule regular PPG meetings with SMS reminders, dedicated PPG notice boards and a translator if necessary, and are delighted to be hosting this event at The Chestnuts Park Surgery. The Chestnuts Park Surgery is committed to delivering high quality care focused on patient needs and safety, and is working to achieve clinical improvement through the implementation and advancement of quality systems, as well as continually reviewing and investing in training and education of staff.